Just as each individual is unique, so every birth story is different. I have four to prove it. My children have been born in four different cities on two continents under four sets of very different circumstances. Of all my births to date, I was the most nervous before the last one, my fourth baby. 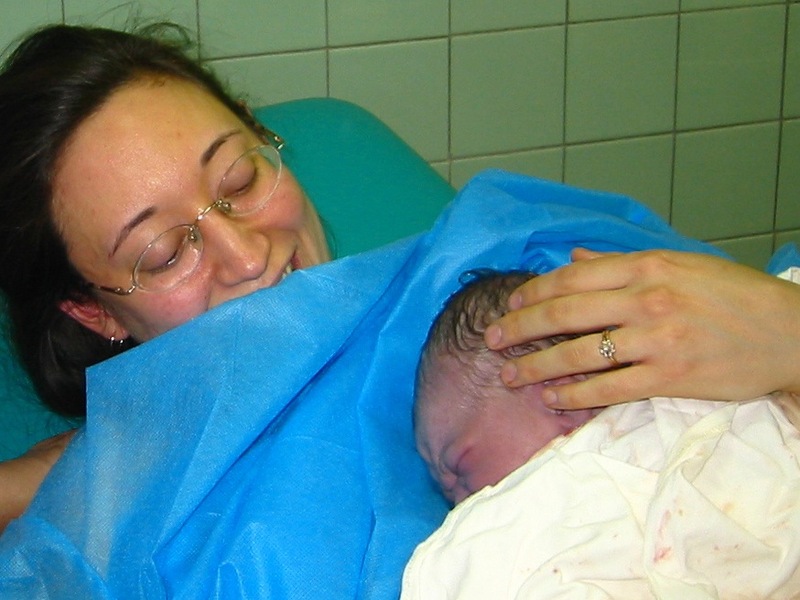 My eldest was born in a government birthing hospital in Kyiv, the capital city of Ukraine. The room where I gave birth was not normally used for deliveries. I think its normal function was as an examination room, but so many women had come to the hospital to give birth the same evening that I did, that there was nowhere else for them to put me. There was a toilet in a closet next door, giving new meaning to the European term “water closet.” The toilet had no seat, just bare porcelain, but it appeared to be clean, and I was thankful that it was a Western-style toilet and not one of the older squatty potties prevalent in Ukraine and a number of other countries. The doctor thoughtfully provided a doughnut-shaped piece of rubberized fabric to serve as a make-shift seat. I wanted my husband and mother-in-law to be present with me, but hospital policy only allowed for one guest. However, the same accomodating doctor used her authority as the head of the department not only to allow both to attend the birth, but to permit my mother-in-law to stay in the hospital with me for the mandatory four days after the birth. She also waived the requirements that I undergo several unpleasant procedures prior to the delivery. I was grateful for all these considerations. However, the delivery experience itself left much to be desired. If fact, that was the last time my caring husband has ever allowed me to set foot in a Ukrainian hospital while in labor. Birth #1: The baby and I were both traumatized, but it was still unspeakably sweet to cradle my firstborn. My second was born in the United States while I was back for the wedding of my best friend. The hospital where I gave birth was ranked as one of the 100 best hospitals in the country. Their policy was that the mother could have as many people as she wanted present in the delivery room, so my husband, mother-in-law, sister-in-law, and 22-month-old son all attended the birth. The delivery room had a fancy electric bed that could be reconfigured to support the mother in just about any position she wanted, a beautiful private bathroom complete with shower, and a Jacuzzi-style hot tub. I was attended by an extremely competent nurse-midwife and a friendly nurse, and the two of them worked as a team to support me in allowing my body to do what God had designed it to do. I spent most of my time in the hot tub, emerging only after the first gentle push that succeeded in breaking my water and moving the baby’s head down to the opening of the birth canal. I squatted on the floor beside the hot tub, my arms wrapped around my husband’s neck for balance, and two contractions later, our second son was born. 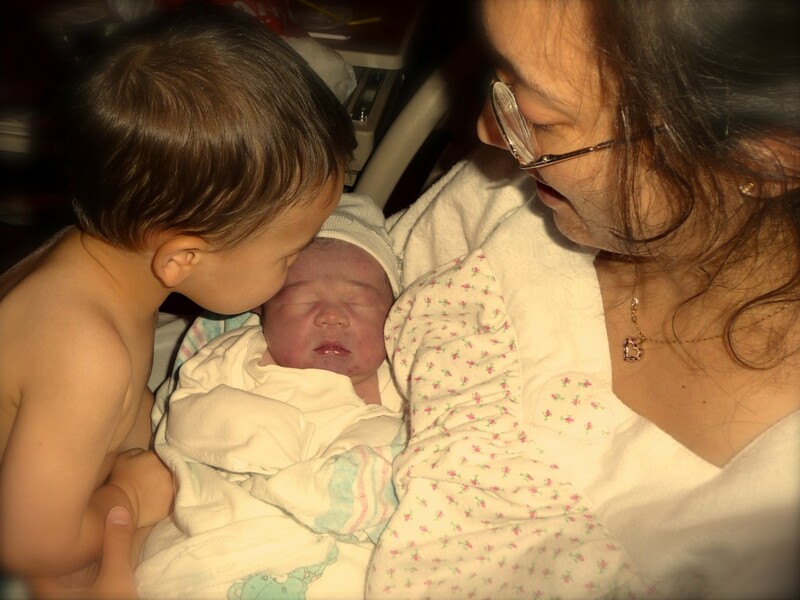 Birth #2: My older son welcomes his baby brother. None of my children have ever shown any jealousy towards a new baby. My theory is that since they have all been present at the births of their younger siblings, they understand that the new little one came from my body and has a legitimate right to my attention. And since I don’t disappear for a few days and then return with a baby, I think they don’t feel threatened by the changes that a newborn brings. I want to pause here to insert an editorial note. My two hospital births in Ukraine and the United States were almost at opposite ends of the desirable-undesirable spectrum, but I don’t think my experiences necessarily reflect the norm in either country. I know women who have been very pleased with their hospital births in Ukraine and others who have had dismal experiences in the United States. I share what I share here for the sake of giving the background behind our decisions with future births. While it is common knowledge that the United States has some of the best medical care in the world, it is not my intent to discredit Ukrainian healthcare or elevate the U.S. system. My third was born in the home of a friend in a suburb of Kyiv. After our first birth experience in a Ukrainian hospital, we were determined to avoid a repeat, so we started looking for other options and were able to get in touch with several midwives who attended home births. Unfortunately, they all lived in Kyiv, and by that time, we had moved to a city about 420 km (260 miles) away. The midwife we liked the best told us that, while some midwives would travel to their patients in other parts of the country, she didn’t. If we wanted to use her, we would have to come to her. So, a week before my due date, we packed our station wagon, and our family of four headed to Kyiv to await the arrival of our fifth member. The baby was turned posterior (head down but facing forward, instead of looking at the mother’s spine), which made for a slower, more difficult labor than I was used to. But our friend’s house was equipped with a hot tub, and I was surrounded by caring, supportive people, so the whole experience was peaceful and joyous. I eventually gave birth in the tub, and my husband, two children, mother-in-law, sister-in-law, two friends, and the midwife were present to welcome the new little life. My fourth child was also born in a home; this time, our own. The midwife who delivered our third child agreed to come to us for the birth of our fourth. The plan was for her to come about a week before my due date and stay with us until the baby came. Our back-up plan was for a friend who was in her final year of medical school to attend the birth. We were in touch with our midwife off-and-on throughout the pregnancy, but when we called her about a month before the due date to arrange the details of her arrival, she didn’t answer her phone. This was not uncommon if she was attending a birth, so we tried again the next day . . . and the next . . . and the next. We called; we texted; we waited and prayed. Finally, after a week or more of trying to get in touch with the midwife, her daughter contacted us. She explained that her mother had made what was supposed to be a quick trip to Russia, but while there, something happened, and she ended up in the hospital. She was still hospitalized, and they didn’t know when she would be released. The earliest possible date she might return to Ukraine was only a few days before my due date! Despite this news, I still hoped that things would work out according to plan. Our midwife would come back to Ukraine as soon as possible, she would be strong enough to travel to us, I would not go into labor early, and we would have another peaceful, beautiful home birth. I think my husband was being a bit more realistic; he was preparing for an unassisted home birth. I use the word “preparing” loosely, since as far as I could tell, the full extent of his preparation was to admit that this outcome was likely and decide that he was okay with it. I, on the other hand, was not okay with it. I guess that technically we were never really facing an unassisted home birth, because our medical-student friend was standing by in the event that our midwife couldn’t make it, but although the former had spent several summers assisting an ob/gyn and had even delivered three babies under supervision, somehow that knowledge gave me little consolation. It can take me a while to adjust to a sudden change of plans, and I was having enormous difficulty embracing this unexpected development. I knew that the Bible tells us, “Be anxious for nothing, but in everything by prayer and supplication with thanksgiving make your requests known unto God,” but though I was trying my honest best to follow this injunction, I still was not experiencing the promised “peace that passes all understanding” which was supposed to be the result. Instead I was consumed with anxiety. I knew that God was in control of the situation, that nothing would happen apart from His will, and that I could trust Him to arrange things for my good. I remembered our previous birth experiences and how He had guided us and protected us, but none of this knowledge seemed to penetrate my heart. I wasn’t comfortable with the idea of giving birth without our midwife, but as much as that option frightened me, the idea of giving birth in a Ukrainian hospital frightened me even more. Neither my husband nor I considered the latter to be an option. As the days passed and we still had no word from our midwife, we began to gather additional supplies for the birth, things that she had brought with her when she attended the birth of our third child: sterile gloves, a trumpet-shaped instrument for listening to the baby’s heartbeat, clamps for the umbilical cord, and injections to stop hemorrhaging. Then, five days before my due date, I started to have contractions . . . If you enjoyed this, please consider subscribing here. I would be honored to have the privilege of encouraging you on a regular basis! This entry was posted in Baby Joys, Inspiration by Sharon. Bookmark the permalink. I’ve had several “unattended births,” and that’s actually the way I like them, but I also know how scary anticipating them can be. Ah, but I couldn’t end at a boring part; where’s the fun in that? Were your unattended births in Ukraine? I’m amazed to have two comments in a row from women who’ve had planned unattended births, because I didn’t think they were that common. And you’re both in Ukraine–what a coincidence. On the other hand, I know two other women who have had unattended home births. Both were inspired by my home birth experiences and decided to do it solo, maybe because they couldn’t afford a midwife, but I don’t know. I think perhaps it says something about the lack of good birthing options here. Two in Russia, one in Ukraine. For my Ukraine one, it was during a 3-month period when births outside hospitals were against the law! (Think about that. Men wrote that law.) They repealed that law 4 days after he was born, but it was still a little bit of a legal mess. Thanks for sending your friends over. It’s an interesting discussion we’re having here! “Of course!” she snapped. “Otherwise, everyone would give birth at home.” It seemed to me this doctor was saying that only threat of prosecution would induce most women in labor to set foot in a hospital. Thankfully, things are changing as the mothers of Ukraine demand more humane treatment. I have heard really good things about one hospital in Lutsk, and there is a hospital in our city that actually boasts a single birthing stool. Convincing a doctor to let you use it, however, is another matter. Maybe that will come with time. Thanks for “visiting”! It’s always fun to see a new face around here. Were any of your births in Ukraine? We had a few extra hoops to jump through to get the birth certificate the second time around. It seems like perhaps the government is (was?) trying to discourage giving birth outside the hospital. Well, I’ll join the discussion! Phyllis sent me here too. Very interesting birth stories…and yes I’m in favor of finishing the story asap! 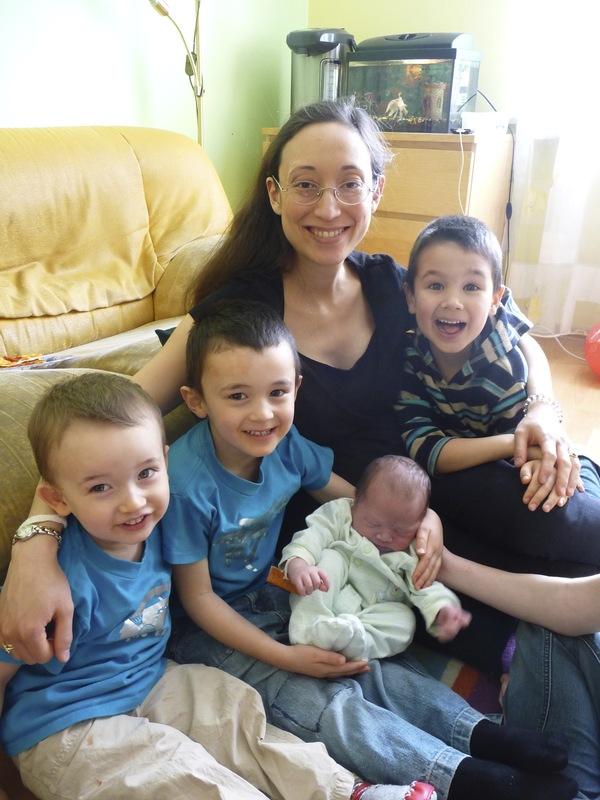 My name is Katelin and we live and work in L’viv, Ukraine as missionaries. I’ve lived here for 4.5 years and my husband has been here for 10.5 years. We have two little girls, both born here in L’viv. My first birth experience was in a government hospital and was similar to your first birth experience, although not as bad. My physical recovery didn’t take a year, but the emotional recovery took a long time (and still lingers.) Our second birth was in a different birthing hospital and was a much better experience (the best we feel like we can get in a Ukrainian hospital environment), yet left several things to be desired. 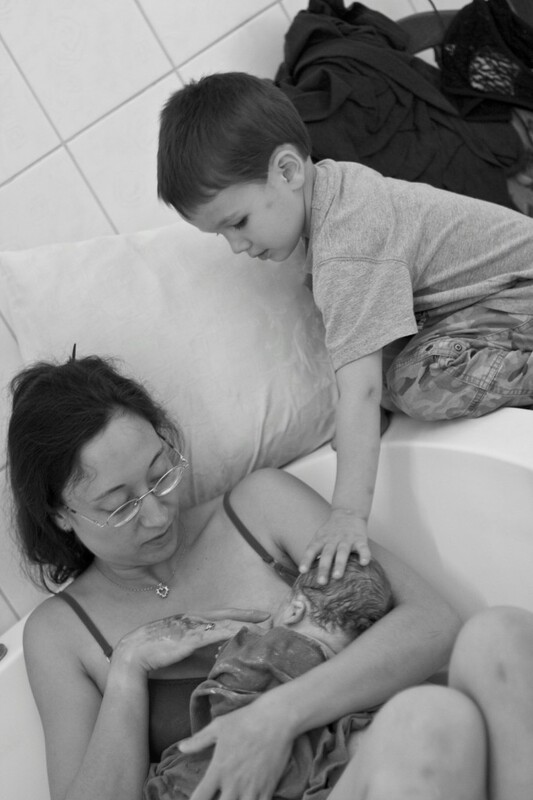 We would love to do be able to do a home birth here, but don’t have any contacts for midwives, etc. Also, my husband’s main concern is being able to get the necessary documents for our child. I have one Ukrainian friend who did an unassisted home birth. The experience was beautiful and they would love to repeat it. She went to the hospital several hours after the home birth to get documents, I believe, and that experience was not pleasant. She doesn’t plan on going to the hospital so quickly next time, but instead waiting a few days at home first. Welcome, and thanks for joining our discussion! I’m so sorry you had such a bad experience with your first birth. I’m passionate about this subject. It angers me that healthcare workers, both in Ukraine and the States and everywhere in between, knowingly or unknowingly, create environments and situations that turn what should be one of the most beautiful experiences in a woman’s life into a horror story. I’m sorry you also had to go through that. After the birth of my first son, I was so traumatized that it was weeks or months before I could imagine ever having another child. You can read my comment below to Phyllis to see a bit more about how we got our birth certificate. It was more trouble this time than with our first home birth, but nothing compares to the nine months we spent trying to get the birth certificate for our one son who was born in a Ukrainian hospital! We had to pay a fine too, like Phyllis, although it was an insignificant amount. Interesting, because we walked out of the hospitals both times with our birth certificates in hand. I was there for 2 or 3 days. As much as I am a proponent of home birth, it seems like each of you have had to check into the hospital anyway, just to get your documents. Maybe it’s not a big deal for you because you had your baby at home the way you wanted to and that part went well. Now, you just have to deal with grumpy people at the hospital that don’t like you and don’t know what to do with you! That’s great to hear about the second hospital you used! I’ve heard good things about a hospital in Lutsk as well. I could care less about the remodeling job, as long as the birth attendants have a hands-off sort of philosophy. Do you know what I mean? I see their job being like fire insurance, to aid in the case of emergency. From what I’ve heard, the staff at the hospital in Lutsk is more progressive in this way. We considered that hospital, but it’s too far away over bad roads to be a good option for us, and we like the simplicity of home birth. We had to “go to court” to get our birth certificate, too. Really, that just meant that my husband dropped our documents off there, and they called us once they had decided. Then we had to go pay a fine for being late with applying for the birth certificate. I think that was 16 gr, if I’m remembering right. It was some small amount, and they apologized for making us pay it. I did go to a roddom for a few days right after the birth, hoping that it would help with documents, but that was a big mistake. It didn’t help anything. They just traumatized me, and then refused to give me any kind of paperwork, because I hadn’t had the baby there.